Thank you to our alums! We've been blessed to have great alums. We often ask for feedback from our students, and sometimes it comes in unsolicited. We've compiled some email below—with permission of course!—that we've received over the years. Self-taught in calligraphy since my younger age, I still wanted to acquire some good modern calligraphy basics to start running my business. 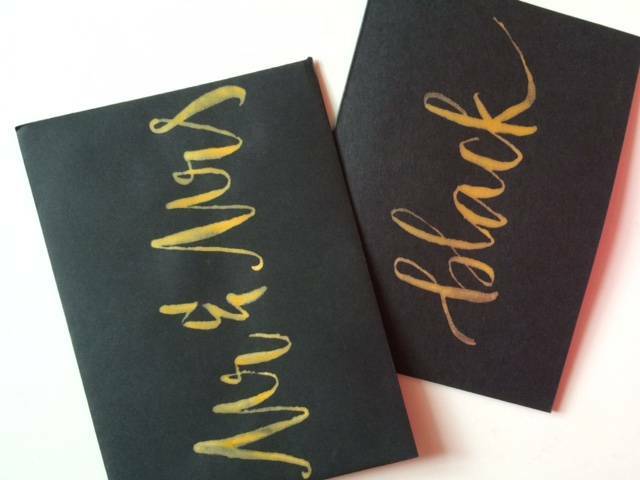 Living in France, I’ve looked for many courses online and Calligraphy.org was the one I liked right away. Every step is very well explained and the fact that Melissa and Erika give a personal feedback is amazing and really one of a kind. The very detailed feedbacks, along with photos, enabled me to clearly see the improvement in my calligraphy. Even being thousands of miles away, I felt I was taking a private class. Plus, their enthusiasm encouraged me a lot! I found almost all my answers in the course, and for the rest of my questions, I asked them via email. This calligraphy class enlightened my summer and I recommend it 100%. After the Modern Calligraphy class I went from not knowing how to even get ink on a nib properly to being asked to do wedding invitations for people! I had been skeptical about how helpful feedback could be from an online class, but the feedback for each assignment was incredibly specific and helpful. They manage to pinpoint exactly why something isn't looking quite right and offer a solution. From tips on improving your letter forms to advice about your supplies- these guys are the best. I'm officially hooked on calligraphy and can't wait for the next class! I took your course a couple months ago and just wanted to say how happy I am to have the art of calligraphy in my life now. I especially enjoy playing around with less formal and more free flowing things, like a card for an upcoming wedding. Just finished the course, I thought it was fantastic and really appreciated the motivation that getting feedback provided! Even more helpful then I anticipated. Anyway, I was particularly looking forward to uploading a "thank you!" piece of calligraphy. I wasn't totally happy with what I made today but I'm not going to practice more tonight, so I'll send my lunchtime efforts and what I was planning on uploading tonight. I ended up just getting down and dirty with practicing, invested in a lightbox and figuring it out, but they turned out amazing and I got so many comments. I also convinced my friend Giedre that she needed to do the same because she loved it so much, and she also took your class and her invites came out amazing too! But anywho, I know you like seeing your students achievements, so I wanted to share a few photos I took. I haven't done any calligraphy since the wedding (sooo many other things taking up my time) and even looking back at the photos now I am amazed. 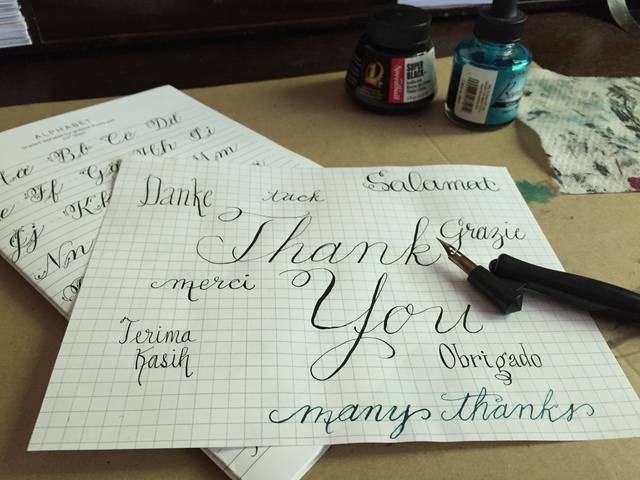 I hope I'm not too late to contribute a testimonial of your calligraphy course! Calligraphy was a skill that I had admired years before taking your course. I would scour Instagram in awe of these talented artists but was always too intimidated try to learn myself. I finally decided to search for online classes, came across yours and after reading all the wonderful reviews, signed up! You took the process of learning calligraphy from intimidating to manageable to totally exciting. 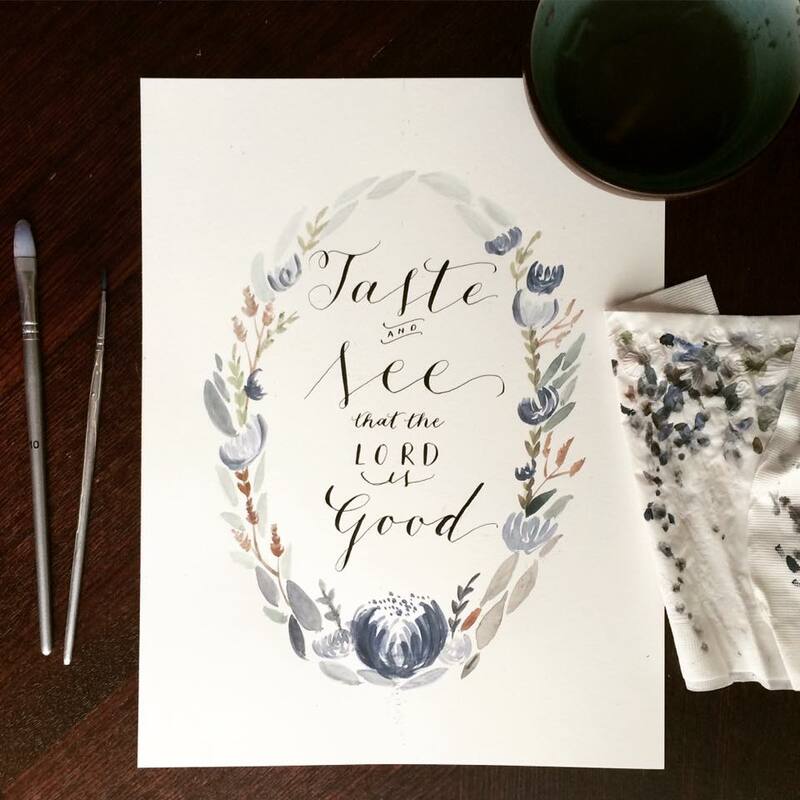 From laying out all the tools we would need (and introducing me to Paper Ink Arts! to coaching me through specific problems and any questions I had, to providing me with an awesome calligraphy community after the class - I am so grateful. 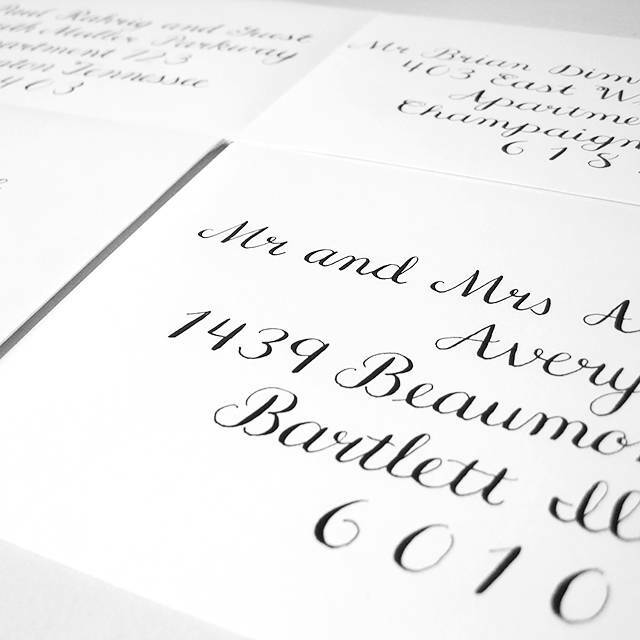 Calligraphy has gone from a hobby to my true passion and it all started with your course! The "I Still Love Calligraphy" facebook group has been an invaluable resource to me as well. I can always count on receiving the best advice from you and others whenever I post a question. Thank you so much for your teaching and continued encouragement! I just wanted to say Thank you. Thank You soooo much!!! This class has been more then just a class to me. It has been a gift! You have helped take something I've always loved doing, writing, and help me turn it into something so beautiful. You've help me realize it's not about being perfect. It's about enjoying the process of expressing who I am in such a beautiful way. I also want you to know that through you and this journey, you have been a huge answer to praying in a season of personal healing for me. Words can not express how thankful and grateful I am for you. My prayer for you is that the Lord bless you in abundance with this special gift you have. 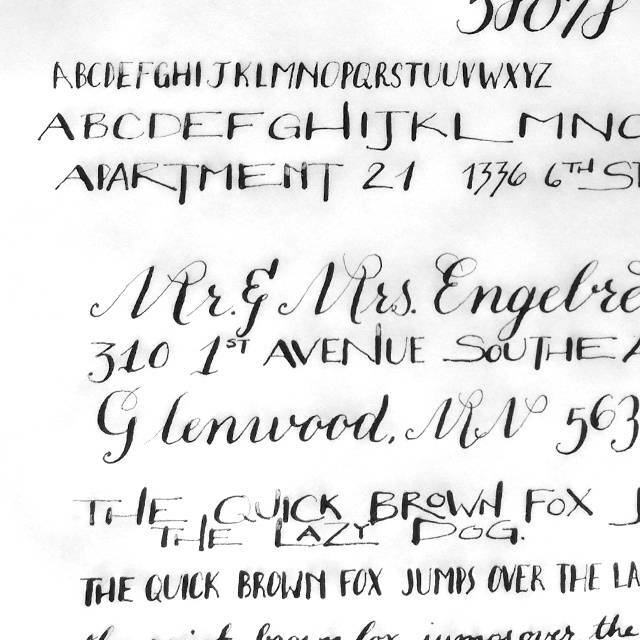 Prior to Melissa's, class, I had self- taught myself calligraphy. After taking her course, I realized how many incorrect methods I had! I remember having a revolutionary moment in my kitchen dining room when I learned that the nib opened and widened to create the width of letters; prior to that, I was going through each letter first to create the skinny lines, and then twice to add the width onto letters!! I know using a calligraphy pen is so basic, but just learning how to use one at all cut all my work in half and made my work much, much, much cleaner. Melissa's personal feedback motivated me to do better. She was so specific in her thoughtful responses. Her analytical responses included addressing the problems with my work and the probable causes of the problem, which helped me correct my habits and prompted me to do better. She also continued to encourage me as I improved with each assignment. I'm a thorough person by nature, so I always looked forward to her responses and her ability to tell me (and show me!) how to improve. 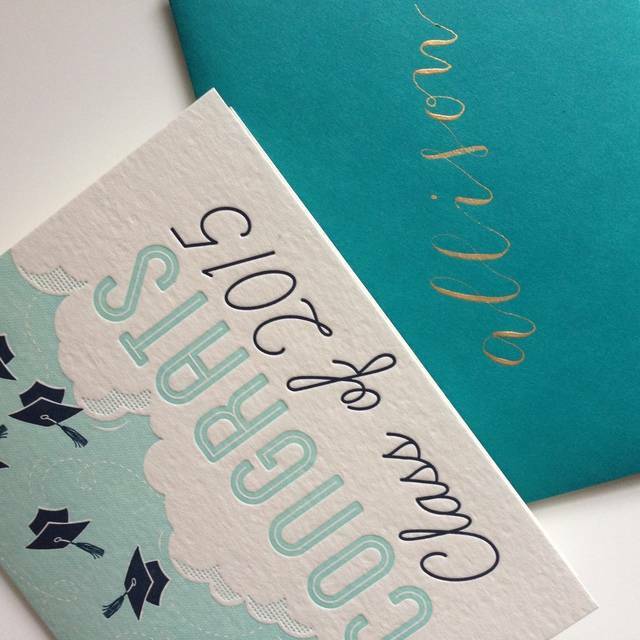 Melissa's class didn't leave me with just a 30 day course; it also gave me the opportunity of calligraphy community through her I Still Love Calligraphy Facebook group. It's a fantastic opportunity to be connected to a group of calligraphers that care about the art and also can offer practical advice. Everyone is sweet and understanding and are quick to offer help or encouragement! Thank you for all of your hard work and instilling a love for calligraphy in me. I had no idea when I asked for calligraphy for Christmas that it could be so much fun and modern. 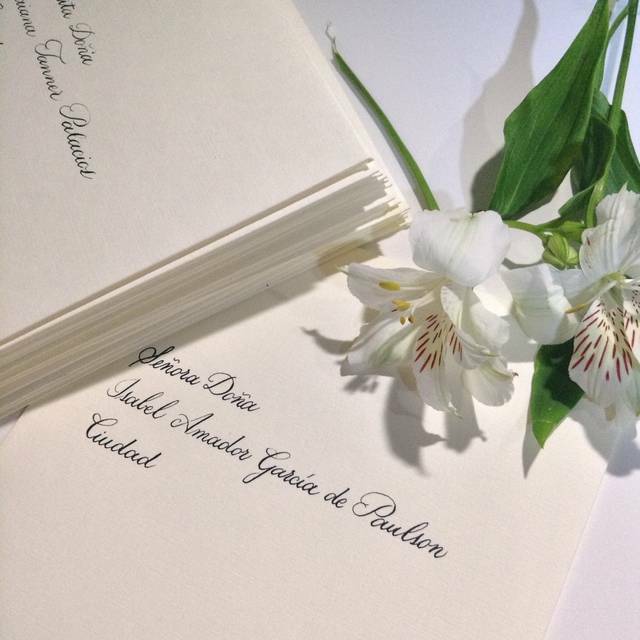 Most of the calligraphy I had seen was more old fashioned and used only for wedding invitations...etc. I was still intrigued by it and wanted to learn the skill. Through your course I have found that I love the modern style of calligraphy. Letter writing and playing around with handwritten fonts are something I have always enjoyed, now with the pointed pen I have a whole new dimension to explore. I follow you and a few other calligraphers on Instagram now so I will continue to be inspired in my new found art love. Thanks! Please receive all the way from teeny-tiny Guayaquil - Ecuador in South America all my love, support and a big fat THANK YOU!!! I stumbled upon your site while searching for a creative outlet to my love of art.. Bored out of my mind with my job with no creativity in my life (I used to dwell heavily in the arts while at school but ended up in a dead end job) and suddenly there you were!! Six months later here I am with 3 orders of wedding envelopes under my belt, a ton of couples interested and a small following on Instagram already! And it's all because of you. So seriously, you are my hero!! For your future students I would say.. do it. The class is wonderful! The level of detail and precision with which the information is given is amazing. Melissa is not only the queen of flourishing sigh..! will I ever get there? but her understanding of how the knowledge should be given and how it could be easier for the student to learn is completely on point. The course is designed in a way that she is so present in your journey.. I have literally emailed her while jumping up and down because a flourish finally turned out smoothly, and also while freaking out when envelope after envelope got splattered and ruined.. You must practice of course, nothing happens over night; but she is an inspiration, the best at her line of work, a guiding hand for her students, and you can tell she is a great mom and wife. Although I have finished the class a while back and of course never having met her, she is still very much present and is still helping me out, answering questions and having my back; with kind words of encouragement through social media and serving major inspiration daily. For me.. it was the best decision ever! So thank you! Calligraphy has given me so much joy, please don't think I'mm a stalker haha I just feel so much gratitude towards you because you have truly given a set of tools to make my life better. Gosh this is so long.. sorry to babble.. I'm sending you a pic with white background so you can see my work.. I'm @mscaligrafia in Instagram just in case.